Green roofs – rooftops covered with a layer of vegetation–are getting a lot of credit for providing environmental benefits. They have been found to reduce storm water runoff from buildings, conserve energy by moderating rooftop temperatures, restore fragile ecosystems and beautify urban spaces. From Toronto to New York, cities are investing billions in green infrastructure programs that rely on this kind of technology and ongoing research is helping refine its application. Researchers are now looking at how the types of vegetation used in green roof affect their functioning. To date, many designers have used sedum–a genus of low-growing succulent plants that hold water in their leaves–to cover rooftops. Sedum, also known as stonecrop, is found throughout the Northern Hemisphere, and has been favored for its hardiness, shallow root systems and low maintenance requirements. However, two recent studies suggest that grasses or taller shrubs may actually be more effective than sedums at reducing storm water runoff, often a major selling point for green roofs. These studies suggest there is no one-size-fits-all green roof. Stuart Gaffin, a climate scientist at Columbia University’s Earth Institute who specializes in green roofs, says that this kind of study can help contractors and urban planners optimize green roof performance. “More research is always a good idea,” he wrote in an email. A second study, conducted in the UK, also concluded that grasses were most effective at reducing water runoff, followed by forbs (herbaceous flowering plants like sunflowers) and, in last place, sedums. According to Brad Rowe, a professor of horticulture at Michigan State University who did not participate in either study, these findings come as no surprise. The more a plant transpires, releasing the water it absorbed back into the atmosphere, the more it mitigates water runoff, he explained. Sedums close their stomata (the microscopic pores on its leaves) to retain water and thus transpire very little. Even if they keep water in for a while, it is eventually released and adds to runoff. According to Nigel Dunnett, an author of the UK study, previous research on the efficiency of green roofs had focused on their design and structural components, not on the type of plants used. Understanding the impact of vegetation type on the functioning of the system is important step for the field. Sergio Andri, co-author of the Italian study, also stressed that rooftop vegetation should reflect local growing conditions. Gaffin agrees that using local grasses can be an effective and low-maintenance way of covering a green roof. He and Columbia plant ecologist Matt Palmer have begun experimenting with such plants on New York City rooftops. “We planted seeds from a native grassland ecosystem, the Hempstead plains [on Long Island], on the roof of a school in the Bronx, and they’re thriving beautifully,” he said. Using native plants for green roofs could have the additional benefit of restoring patches of fragile or disappearing ecosystems, he added. But Gaffin cautioned against grass as a general trend, explaining that efficiency of green roofs depends on many things. “The type of plant used plays a role, but also the depth of the substrate used, and the structural design of the green roof,” he said, pointing to a recent study by his team which showed that the use of pre-fabricated modules containing plants – favored because they are easy to install on any roof – retain storm water much less well than green roofs built from the floor up. Neither would Gaffin write off sedum. “I like sedum. It’s a very tough plant, usually a low-risk choice” for use on green roofs, he said. As more and more cities are integrating green roofs into their planning, scientists are hard at work looking for ways to streamline the use of this technology while accounting for differing conditions and aims. I also wish to say I am disappointed each of the studies cited were to websites that require you to purchase their papers. So much for the free dissemination of ideas. We agree with the majority of this article and especially the comment that one size does not fit all. This area is still very much in its infancy and while storm water run off is a major issue in some areas there are many more widely accepted reasons for choosing a green roof. For most residential property owners their decision making process is far more geared to the environmentally friendly benefits of the green roof. However, most are put off by the cost, especially if they have a particularly forceful designer or architect. This seems to be a trending industry although it does not seem to have taken off so far in the residential areas of London. Prohibitive costs I would imagine. I certainly hope that it will take off in the future. I own a roofing, siding and gutter company in Ohio. I’m seeing more and more commercial Client interest in Green roofs but the cost is definitely the factor that sways them against installation. 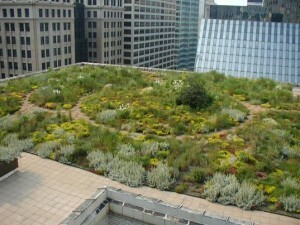 I’ve done alot of research on Green roofs and have been interested in possibly installing them in the future. I’ve also worked as a Staff Reporter for the city newspaper nearby and covered a story on this subject. It certainly would be beneficial to the environment and I’m all for that but it would be great if we could find a way to lower cost. Great article. I love how inspirational ideas are starting to make it through in the construction industry especially with new building projects. There is a building in Bristol which we installed using this idea with partitions to capture maximum rain water which feeds into a glass valley and is then filtered back into the house. There is hope for the planet yet!